In the age of Google Maps and GPS, which can dictate the exact turns you’ll need to navigate an unfamiliar city, are paper maps obsolete? Maps do so much more than help you navigate. 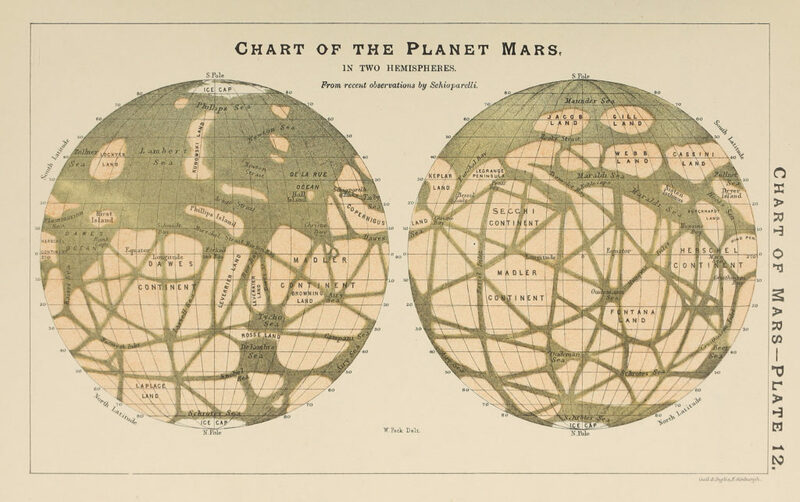 In “All Over the Map: A Cartographic Odyssey,” published in October, Mason and her co-author Greg Miller explore more than 200 maps from all points in history and all across the planets. A few even dip into imaginary worlds. Near the beginning of the book, you’ll find a map that shows 6,000 years of Mississippi River meandering; near the end, you’ll encounter the famously elusive Death Star plans from the Star Wars movies. In between, there are maps of trade routes, brain cells, geologic faults and ancient cities. 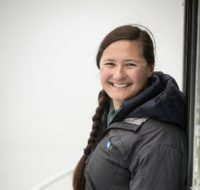 In an interview with the PBS NewsHour, Mason discussed how maps of all kinds help people understand the ways in which people, places and ideas are connected, and how we can relate to the world around us. The conversation has been edited for length. What is it about maps that draws your attention? I really didn’t know how to answer that. I think it’s because there are so many reasons — it’s so obvious in a way. You put something on a map and it looks true. It feels true. There is some science suggesting that our brains interact with spatial diagrams like maps in a different way than anything else. People tend to believe them. You put something on a map and it looks true. It feels true. There’s an idea that maps are trying to display some reality. And if you know how to look at a map, you can learn all sorts of things about the map maker’s intents and priorities — and their ideas about the world and about themselves. Maps are meant to show a relationship, to lay it out on a page, but some maps in the book actually prompted a discovery. How do people uncover new things using maps? 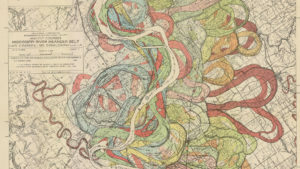 A few that come to mind right away are the maps made by geologists right after the 1906 earthquake [in San Francisco]. By mapping the damage and comparing it to the geology, they were able to discover for the first time that the geology that underlies a structure is a big factor in the risk that it has [for collapsing]. They figured out by comparing the map of the damage to the map of the geology that some kinds of rock are more dangerous than others. Buildings built on looser sediment are going to shake more and are more likely to collapse. We didn’t understand that before. Of course, that did not stop San Francisco from immediately rebuilding on top of those more dangerous areas, and in fact using some of the debris from the landscape to build more landfill, so that lesson was not learned quickly enough. In a completely different kind of science, there are maps that [Spanish neuroscientist] Santiago Ramón y Cajal made about how information flows through different parts of the brain. He was able to understand neural circuits for the first time. By sketching the individual neurons and how they relate to each other, he deduced how they transmit information from one to the other. That’s a very spatial discovery made from what I consider maps. Maps can also be misleading. What can we learn from misinterpreted maps? Many people will probably have heard about John Snow’s map of the cholera epidemic in 1850 in SoHo [a neighborhood in London]. 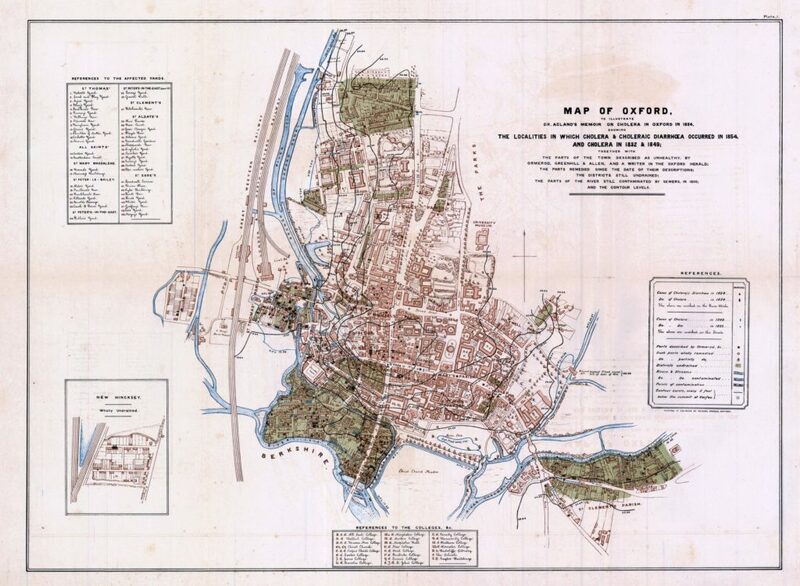 Well, there was another physician mapping cholera at the exact same time in Oxford, England who did a much more detailed map that included things like elevation contours. His conclusion was that the old miasmatic theory of disease was in fact correct. It looked to him like there were more cases of cholera in the low-lying areas of Oxford — and that the areas that were on a little bit of topography, where of course there would be more wind cleaning out the “noxious air,” had fewer cases. What he didn’t realize is that they also had a different water source — wells, as opposed to the contaminated rivers. …You mean when people thought aliens had made canals on Mars? What about fictional maps? What can they teach us? This guy Jerry [Gretzinger] has been mapping this imaginary world for 35 years, and he’s still working on it. The map is 55 feet across at least, at this point. It’s made of more than 3,500 8-by-10 panels, and he just keeps working on it. And he’s not just adding to it. He’s editing. 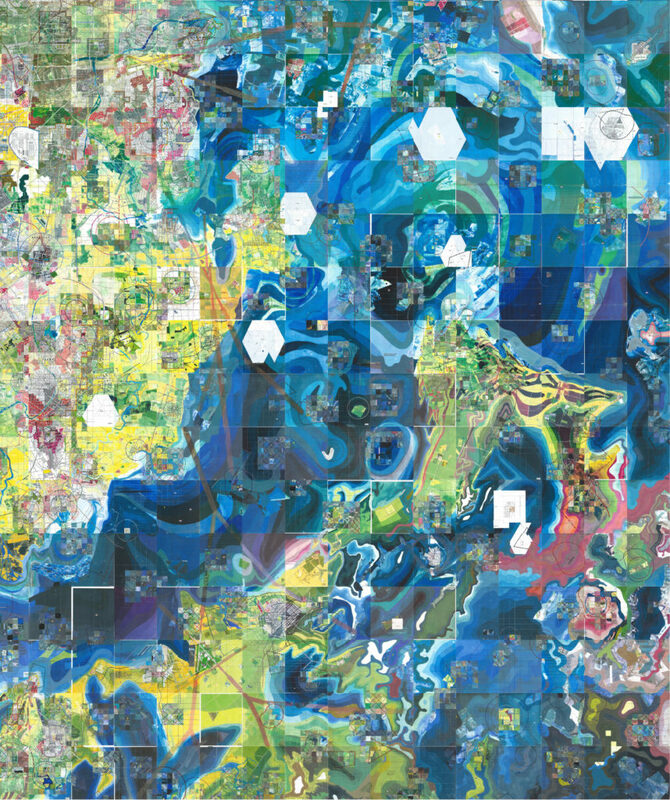 He’s adding to existing panels–the map is just constantly changing. It makes you wonder: How does somebody do a project for that long and keep it up and stay interested in it? He still works on it every day, and I couldn’t really figure out why. I don’t think he really knows why. I spent hours on the phone with him trying to understand why he makes this map, and I don’t think I do. But I love that he does it. What do you think people can take away from this book? We hope people discover that maps are a really interesting way to explore the world, to explore history and imagination, or design, or culture or politics. That’s what the book was for us — an exploration of the world, not only in the geographical sense but in every sense. Maps can take you places that you wouldn’t think to go. You can see a beautiful map, and it pulls you in — you want to look at it. Then you find you learned something about history, or your city or some scientific discovery that you had no idea was based on a map. All images appear in the book All Over the Map by Betsy Mason and Greg Miller, published by National Geographic in October, 2018.